We saw a lot of controllers at CES, but Novint's Falcon stood out from the pack. It's a force feedback 3D controller designed for PC games. Users hold the grip handshake style and can then move it up/down, left/right, or backwards/forwards. that it reacts depending on the app or game you're playing. 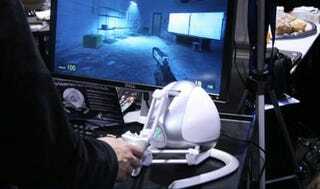 We demoed it with Half Life and after a few seconds of adjustment found it was both easy to use and accurate. The knob has 3 buttons you use for firing, and each time you fire, the Falcon provides a push backwards. The bigger the gun you're shooting, the stronger the jolt backwards. Another demo had us pushing an object on the screen. Again, the Falcon provided resistance when pushing on the hand grip. Our only complaint was the Falcon's size. It stands pretty high and requires a bit of desktop space. It also has this weird dental machine/space robot look to it. It's not the prettiest controller out there. Otherwise, it's expected to come out in June for $239 and will ship with a few micro games.